With new computing technologies, machine learning today is not like machine learning of the past. It was born from pattern recognition and the theory that computers can learn without being programmed to perform specific tasks. Today, Machine Learning is the that current application of AI based around the idea that we should really just be able to give machines access to data and let them learn for themselves. 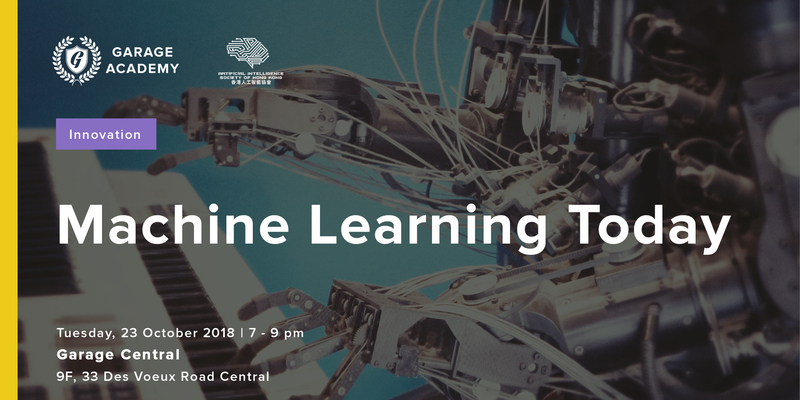 Join AI Society at Garage Society to hear from two accomplished speakers on the applications of Machine Leaning in today’s use cases in Hong Kong & beyond. Limited tickets available, sign up early to secure your seat! Keith C.C. Chan graduated with a B.Math. (Hons.) degree in Computer Science and Statistics and a M.A.Sc. and Ph.D. degree in Systems Design Engineering from the University of Waterloo, Waterloo, Ontario, Canada. Soon after graduation, he joined the IBM Canada Laboratory in Toronto, Ontario, Canada, as a software analyst and was involved in the development of multimedia and software engineering tools. After spending four years in the industry, he decided to return to the academia. He joined the Ryerson University in Toronto, Canada as an Associate Professor for a year and chose to return to Hong Kong to join The Hong Kong Polytechnic University where he is currently a Professor in the Department of Computing. From 2002 to 2008, he was the Head of the department and from 2011 to 2016, he was the Dean of Students of the university. For more than thirty years, Prof. Chan has been working in Artificial Intelligence, Machine Learning, Fuzzy Systems and Nature-Inspired Computing. He has close to 300 research publications in these areas in refereed journals and conference proceedings and has also been serving actively as organizer and program committee member of numerous conferences. Chan’s research has been supported by the Research Grants Council, the Innovation and Technology Commission of the HKSAR Government and the industry. He has been active in “knowledge transfer” through consulting and contract research. Jeffrey Ng, Chartered Financial Analyst (CFA), has over 10 years of professional experiences in applying machine learning in banking. Most recently he is the head of Data Lab at an European bank in Asia-Pacific. He specialises in building up analytics team and interacting with C suites on AI use cases. Being fluent in several languages, including English, Python, SAS and Mandarin, he has served retail and wholesale banking in Hong Kong, Singapore and Shenzhen, in the area of risk, marketing, operations and finance. Ex PwC Consulting and GE. Outside of work, he volunteers at NGO and high school on AI education, with a hope that it transcends the future of kids that do not have the “convenience” of private schooling system. He is a MBA from The Chinese University of Hong Kong and double first honours in BSc Computing and BA Management. Most proudly and thankfully, Jeffrey is the ex student of Prof Chan. Eric Thain is President of Artificial Intelligence Society of Hong Kong, pushing the role & integration of AI in the modern brand space. Eric is also the General Manager of HK Express, a widely known marketing professional in Asia and a senior marketer with 17+ years of agency and in-house experience in developing Integrated Marketing Strategies and leading Digital Transformation projects across APAC (including a decade of in-market experience in China). Eric is a hybrid experienced business leader with profound mixed discipline experience across the marketing & digital ecosystem, primarily with focus on omnichannal digital marketing, analytics, artificial intelligence, social marketing, path to purchase modelling & e-commerce operation solutions.